Arizonans without employer-provided health insurance were finally able to shop for policies Tuesday on a federally run website, with nonprofits providing outreach and assistance to potential enrollees trying to navigate the process. The website (http://www.healthcare.gov) lets individuals shop for different levels of insurance and see if they’re eligible for subsidies to help pay some of the costs. Gov. Jan Brewer decided Arizona should join the federal exchange rather than run a state marketplace. The website was having problems handling all the traffic, but there was no reason to rush. People can sign up as late as Dec. 15 and still have coverage in place on Jan. 1, said Allen Gjersvig, director of health care innovation at the Arizona Alliance for Community Health Centers. The new program is a key part of President Barack Obama’s Affordable Care Act, but many people were struggling to get onto the website and sign up. An Associated Press reporter and Gjersvig both had problems getting past the security questions screen on the main signup page — an issue seen across the country. Obama said more than 1 million people nationwide had visited the government’s main website before 7 a.m. EDT, and officials were scrambling to fix the glitches. Ten large insurers filed applications with the state to sell insurance on the exchange, including Aetna, Blue Cross Blue Shield of Arizona, and Cigna. The plans are offered at four coverage levels, plus a catastrophic plan only available to people under 30 and some with limited incomes. One of the major differences between current insurance and that available after Jan. 1 is that companies now have to offer plans to people with pre-existing conditions and can’t charge them higher rates. Many people also will qualify for tax credits that will lower the monthly price. 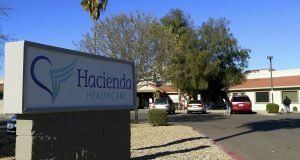 Seventeen Arizona health centers split $2.3 million to help people sign up for insurance, while another $2.1 million was awarded to four groups, including Gjersvig’s, to hire “navigators” to help people enroll. About 20 percent of Arizonans don’t have insurance, but at least 300,000 are expected to get Medicaid coverage for the poor starting Jan. 1. That leaves about 700,000 people without insurance, many of them eligible to buy it through the exchange. For those newly qualifying for the state’s Medicaid program, which is expanding to include individuals and families making up to 138 percent of the federal poverty limit — navigators are advising those people to skip the federal health exchange site. Instead, they should and go directly to the state Medicaid site, although either site will transfer to the other if a person doesn’t qualify. Individuals earning as much as $11,499 a year and a family of four earning $23,499 qualify. Retirees and disabled people now on Medicare are not affected by the new marketplaces, but Gjersvig said many incorrectly believe they will be. The regular open enrollment period for Medicare runs from Oct. 15 to Dec. 7.